Entry fee: 10 Euro (estimate). 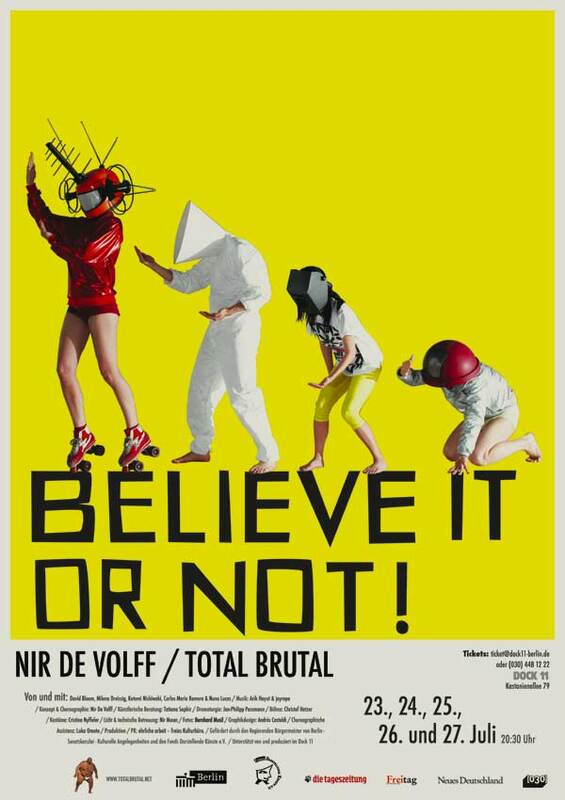 Believe It Or Not is a dance theatre production by Nir De Volff. Music by Arik Hayut & jayrope (both Scenic Panner ), appearing live July 23-27. Yesterday’s visions are today’s nightmare. Going back to the science fiction films of our past, TOTAL BRUTAL presents a kaleidoscope of future scenarios in three parts. BELIEVE – the naiveté and paranoia of a future that would bring us housewife robots and brave man who save the world in the last minute. BELIEVE IT OR NOT – hard bodies and transplants, nothing is certain anymore, the distant them is now the alien we. Welcome to the sundown of the century! FORGET ABOUT IT – Who do you run after when nobody is left? This is the present and the sky is empty, comrades. What did we plan for the day after tomorrow? Funded by the Reigning Mayor of Berlin – Senatskanzlei – Cultural Affairs and Fonds Darstellende Künste e.V. Supported by and produced at Dock 11 / Berlin. Presented by taz, Freitag, Neues Deutschland and 030.